Musicians and sound engineers aren’t the only ones who need to know about PA systems. A PA system is useful for a whole host of venues, like churches, schools, gyms and bars in order to project sound to a group of people. Get clued in so you know exactly what to look for the next time you need speakers. PA stands for public address, i.e projecting sound to a large group of people louder than you could by talking or playing an acoustic instrument. Your first thought of PA speakers could be of those used at concerts or sports stadiums, but there are so many other applications for a PA system that one day you might have to buy one yourself. A public address system used to project sounds from instruments, voices and other acoustic sources. Comprises of microphones, mixers, amplifiers and loudspeakers. Front of house (FOH) speakers point towards the audience, while monitors are directed to the performers. A mixer adjusts EQ and effects. Either on stage or controlled by an audio engineer at a mixing desk. Used everywhere from clubs and leisure centres to arenas and airports. What makes a good PA System? There are loads of variables to determine the best use of a PA system. For example, a busker needs a speaker that’s light and portable, while a venue owner would need a lot more wattage. But the speaker itself isn’t the only essential piece of gear. The sound you want people to hear has to be captured by a microphone before it’s processed by a mixer and then amplified. Identify what you’re going to use the PA for, what venue you’ll be at, the size of the audience and your price range. All-in-one or portable speakers are best for those who don’t want to delve into the fine details of PA. These contain a built-in EQ (cutting out the external mixer) and a power amp that boosts the voltage of the signal. The benefit of having a portable speaker is that everything is contained in one unit. As the name suggests, it’s relatively small so you can chuck it in the back of the car and you’re good to go. However, you’ll miss out on the larger range of sounds and setups you get with separate components. It simply won’t sound as good as other usually more expensive options. A more refined rig would consist of a microphone, connected to a preamp to boost the line level, then into the mixer, then possibly into a power amp and finally a speaker. These are best for larger venues where you require a higher-definition sound. The downside is you (or some poor roadie) will have to transport all this heavy equipment to the venue and then set it up. Wattage – This indicates the potential volume and clarity of the speaker. The higher the wattage, the louder it can get and in general, the more headroom it has. This means you can produce sound at louder volumes without it starting to break up and get fuzzy. Size & weight – Speakers are measured in inches over diameter. The larger the speaker, the more expansive the sound becomes. There’s usually a correlation between size and weight. But weight can also vary based on the various types of woods and materials used to house the speaker. Sound quality – As with any other kind of musical equipment, there is an identifiable correlation between price and sound quality. A musician would value clarity and definition over school teachers or fitness instructors who would want something more simple. Therefore you might sacrifice some portability or compactness over quality, or vice versa. Speakers either come in active or passive varieties. The simple difference is whether they contain a power amp. Active speakers are most common in today’s market, as they’re much more flexible and don’t require an external power amp to drive it. Front of house speakers are essential as they direct sound to the audience. But as a performer, you can either use an in-ear wireless system or monitors to listen back to what you’re doing, which is simply preferential. A mixer takes the microphone signal and equalises it to be as audibly balanced as possible. 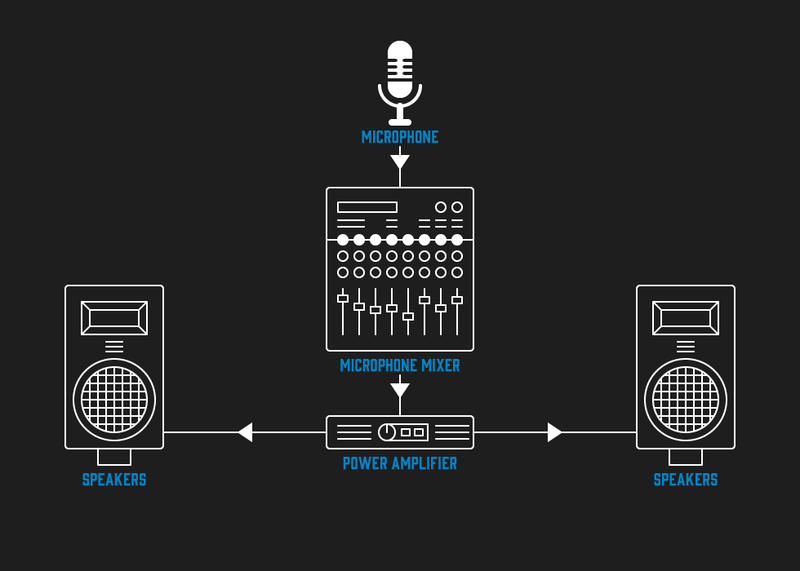 A simple mixer or portable PA system will only have a few inputs, while a professional level mixer will have multiple inputs to accommodate for lots of microphones. General mixer controls consist of high, middle and low frequencies to shape the sound. In a band setting, you want to sculpt each instrument in the mix to keep the collective sound from meshing and becoming a horrible mess. You can also compress or pan inputs for the best sound placement. Most digital mixers will also have built-in effects like delay and reverb. These are especially useful for vocals. A professional sound engineer will adjust these on the fly to suit parts of a song. The great thing about a digital mixer is the ability to recall pre-sets, so you don’t have to spend time tweaking mixes on the day of a show. Have a read of our more in-depth guide to microphones. But here we’ll go over the basics you need to know when hooking one up to a PA system. There are two ‘umbrella’ types of microphones; condenser and dynamic. Condenser mics require phantom power to function. Almost all mixers have built-in phantom power and you can use the internal preamp to adjust the character and gain of the signal. External preamps generally provide better sound quality, lower amounts of noise and unique characteristics. Dynamic mics offer excellent utility as most are multi-pattern. This means they can capture sound from various directions. Condensers, on the other hand, are extremely meticulous and work best with high frequencies. However, they’re more prone to breakage and are normally kept in the studio as a result. That’s all the basics you need to know about PA systems! If you enjoyed this read, check out our other Learn articles. Want to shop for PA systems? Browse the Andertons website.